Did you know a rich flammable mixture can ignite with just 1 Joule of energy ? If that does not surprise you yet, let me tell you how much energy we are talking about here. By just rubbing your hands with force for just one time produces 12 Joules of energy. Surprised ? You are sailing on a bomb, you never know when it is going to explode. And they were absolutely right about that. Back then there were no procedures and controls to mitigate the risks imposed by carrying flammable cargoes in bulk. Fast forward today and we have all the controls to avoid explosions on tankers. But irrespective of type of tanker and controls in place, explosions are always a concern. But what will be a even bigger concern is the people working on tankers not knowing about these controls and the basic terms used on tankers. Well I am sure we all have gone through basic and then advanced courses on tanker operations. But sometimes all that we are taught does not seems to sink in. In this post we will discuss 5 of the basic terms very commonly used on tankers. Ahh !! We all know what is fire triangle ? But when we talk about safety on tankers, fire triangle has to have first mention. It is because every thing we are doing for the safety on tankers is to avoid the three sides of the fire triangle to meet. Fire needs three things to start and continue burning. Fuel, air (or Oxygen) and source of ignition. And when three of these meet, Fuel will catch fire. On tankers all the three are present in abundance. The cargo carried on tankers acts as fuel. Air is present on tankers as it is present elsewhere. And there are few but enough sources of ignitions which if not controlled can make a tanker explode. 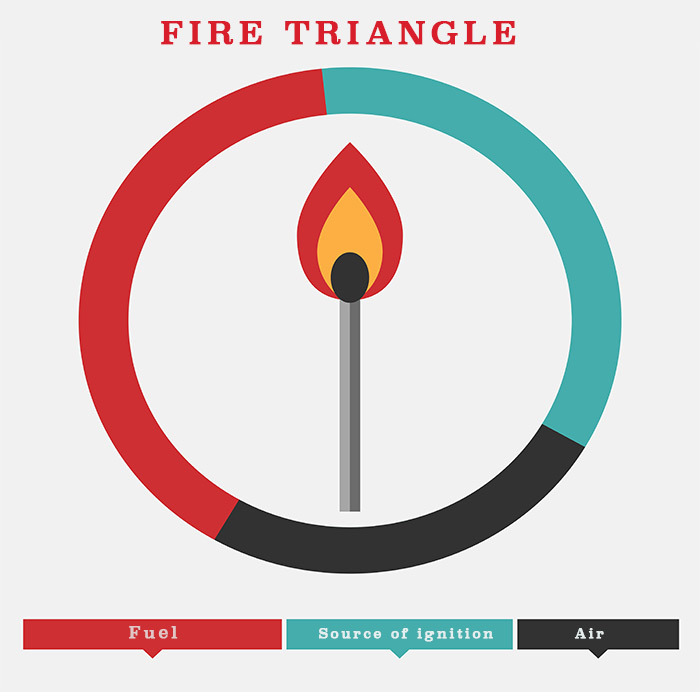 Our only aim is that these three elements of a fire triangle should not be present at the same location. In fact almost all fire safety related regulations are based on achieving this. For example, regulation for inert gas is for reducing the oxygen level in the tank. 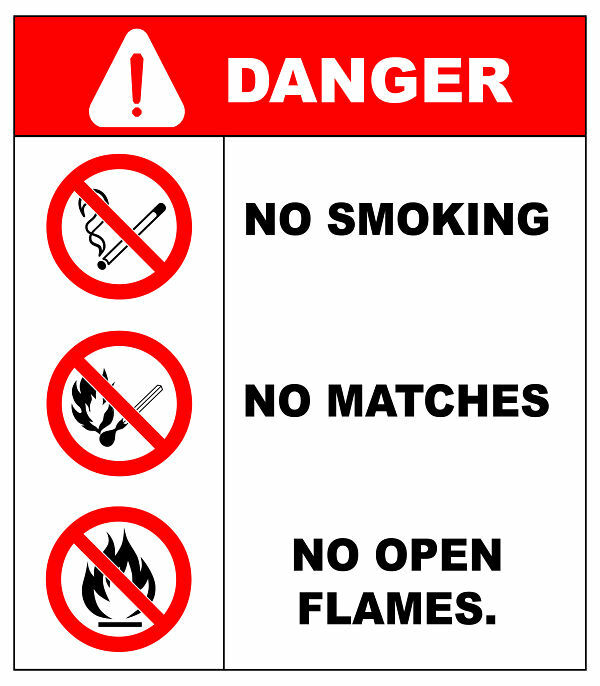 Not allowing lighters, match boxes on deck is for removing the source of ignition. Requirement of maximum Loading rate of 1 m/s for static cargoes is to avoid a spark inside a tank (source of ignition). There are many things we do on tankers to ensure that three elements of the fire triangle do not meet. Even the deck foam system used for deck fires uses the smothering effect to extinguish fire, which aims to remove one element (air) from the fire to extinguish it. When we follow these guidelines, we succeed. But if we do not then this there can be explosion and casualties . 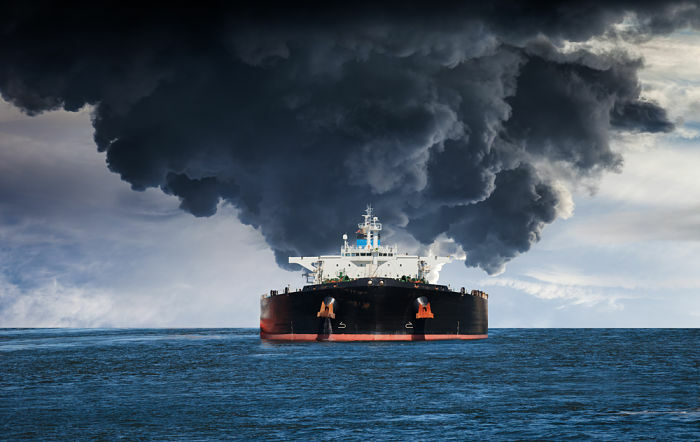 Only the knowledge of the atmosphere on and around tanker vessel can help in avoiding these situation. Let me ask a question. You are on a tanker and you measure the atmosphere of cargo tank by a portable gas meter. The reading shows 80% LEL value. Now if there is any spark inside the tank, will the tank explode ? If you know the answer, well done. If you do not know or are in doubt I hope you will get the answer in this post. As I said fire (or explosion) needs three things to occur. If we leave aside the spark, for something not to explode, either there should be insufficient fuel or insufficient oxygen or both. Lets talk about insufficient fuel. How much less is insufficient ? A 10 litres Jar containing 1 litre of gasoline will explode if we spark it. But a 10000 m3 tank containing same 1 litre of same gasoline may not explode. This is because It is not the fuel that burn but the vapors. A mixture of hydrocarbons and air cannot be burned unless its composition is in the correct range. This range is called flammable range. Vapors of 1 litres of gasoline in 10 litres jar are enough for ignition but in 10000 m3 tank, these are too small and will get diluted in the air inside the tank. This concentration of hydrocarbons is measured as percentage of volume. When we say 10% hydrocarbons by volume inside the empty tank of 10000 m3 capacity, it means around 1000 m3 of hydrocarbons are present. Rest 9000 m3 is air. Now how much percentage of volume of hydrocarbons is insufficient to burn ? Each gas will have different percentage. Isn’t it ? For example, for propane this concentration is 2.3% and for pentane this concentration is 1.5%. If the concentration of propane in a tank is 1.5%, and we spark it, it will not burn. That is because the concentration is below minimum required to burn the mixture of air and propane. This minimum concentration of hydrocarbons required in the air for it to be able to ignite is called lower flammable (or explosion) limit. Want the text book definition of lower flammable (or explosion) limit ? Here it is..
Now let us talk about the insufficient oxygen. When oil is placed in a container, it has a tendency to vaporise. Different liquids (and different oils) have different tendency to vaporise. The amount of vapors emitted also depends upon the surrounding temperature. The concentration of these vapors dilutes the concentration of other gases in the air including oxygen. At some point, these vapors may dilutes the air to a level when there is insufficient oxygen to ignite these vapors. 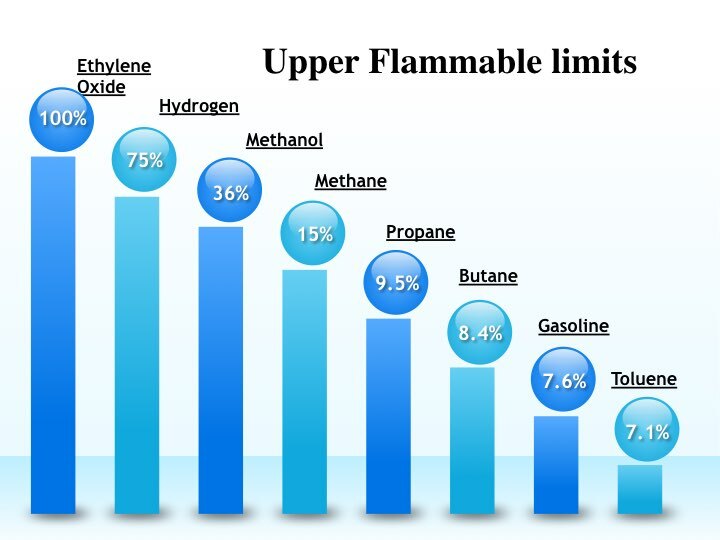 Upper flammable limit is the concentration of hydrocarbons above which there is insufficient air (or oxygen) to support the combustion. Again let us take example of propane. Propane has UFL of 9.5% by volume. So if the concentration of propane is 11%, we can say that there will not be enough air to support combustion and this mixture will not ignite. Now lets say you measure the concentration of butane in a tank and found it to be 2.0% by volume. Are you in flammable range ? 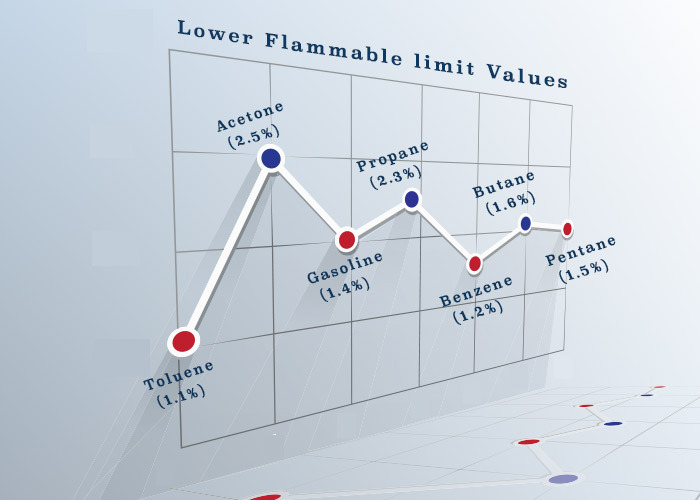 You need to check what is the lower explosive limit of Butane. Right ? And so do we need to know the LEL of each cargo we load. That sounds like crazy. But wait, how about this ? LEL by percentage of volume = 100% LEL. And then we get an equipment to measure percentage of LEL. Now if this equipment shows a reading of 70% LEL, it means it is 30% below the lower explosion limit. Returning back to our question, we now understand that when we say 100% LEL, we have just touched the lower explosive limit. Anything below 100% LEL, we are not in the flammable limit. When the concentration is above 100% LEL, we need to measure the concentration in percentage of volume. Now have you ever come across this flowchart ? This flow chart is from ISGOTT. 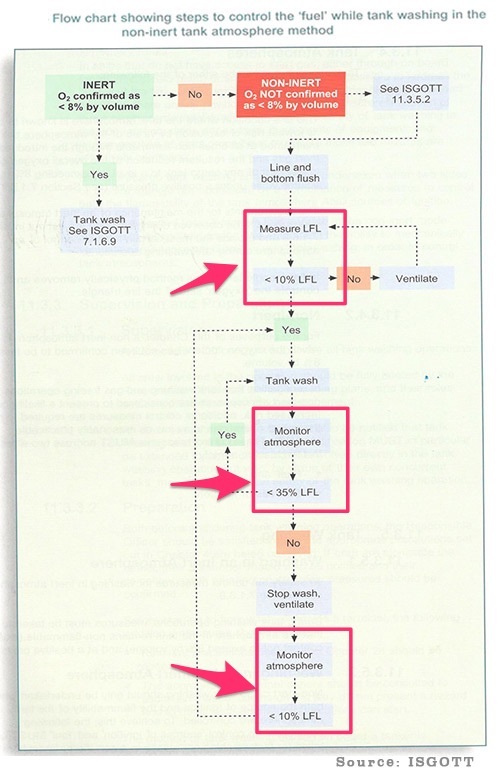 This is the flowchart for tank cleaning on oil tankers in non-inert atmosphere. If you notice the flowchart tries to maintain the hydrocarbon concentration between 10% to 35% LEL. The whole idea is not to allow the tank atmosphere reach in the flammable range (100% LEL). Flammable liquids has a tendency to vaporise. Some of the the vapors also turns back into the liquid and these finally attain an equilibrium state. 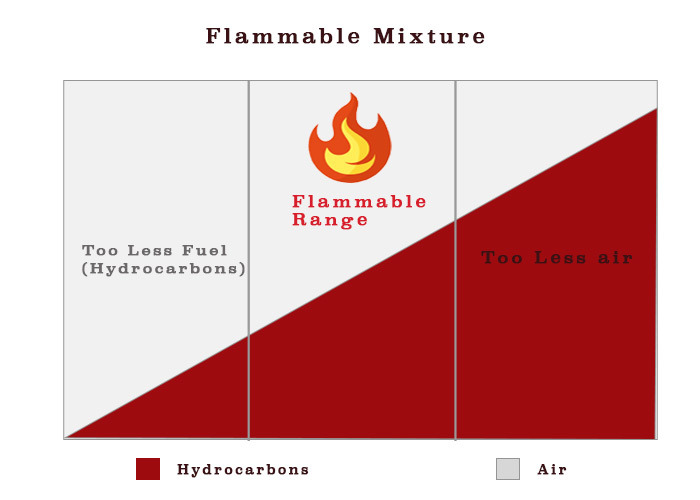 At this equilibrium state, these flammable liquid may have a mixture of hydrocarbon and air that is between LFL and UFL (flammable range). But not all the flammable liquids will be in flammable range at this equilibrium. This depends upon the tendency of the flammable liquid to vaporise. It won’t be hard to believe that with more temperature, the liquid will vaporise more. 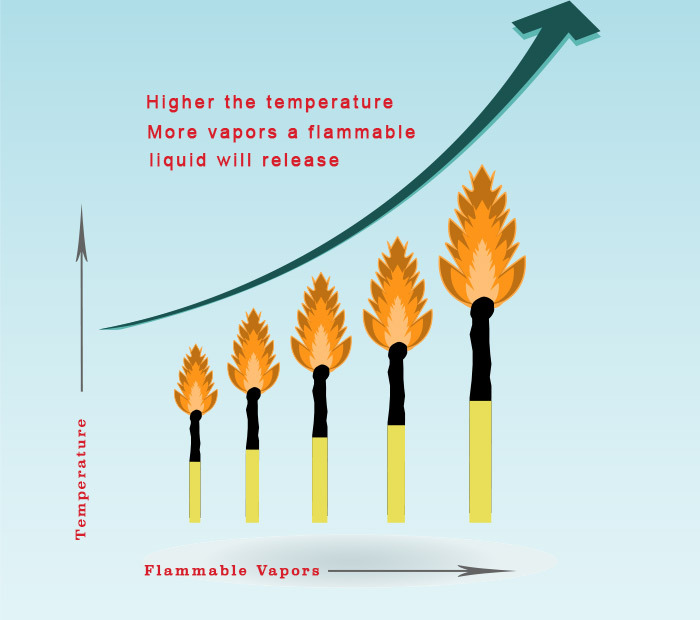 And at some temperature it will release sufficient vapors to form a flammable mixture. Flash point is the minimum temperature at which the liquid emits sufficient vapors to form flammable mixture with the air. Flash point is calculated by heating a liquid slowly and then a spark is applied to the surface of the liquid. The temperature at which surface of the liquid catches fire indicates the presence of flammable mixture. This temperature will be the Flash point of that liquid. This method of determining the flash point is called close cup method. Now why knowledge of flash point is important ? If the flash point of a liquid is less than the ambient temperature, it just needs a spark (source of ignition) to explode. We need to have more stringent controls for these cargoes. This is also the criteria for determining the cargoes that would need stringent controls. Industry has set the ambient temperature criteria as 60 C as a safety margin. Liquids with the flash point of less than 60 C are called volatile liquids. And the one with flash point above 60 C are called non-valatile liquids. Anyone who is or have been on tankers would have seen this diagram called “flammability diagram”. The principle used in the flammability diagram is simple. It emphasizes on the fact that at no point we should be in flammable range during a critical operation. It also shows us a way to do it. Let us say our cargo tank is at point F (10% flammable cargo vapors, oxygen reduced by inert gas). We wish to gas free the tank to arrive at point A where there are no flammable vapors and oxygen content is 21%. If we start putting air inside the tank, the decrease in concentration of flammable vapor and increase in oxygen level will follow a line FA. This passes through flammable range which we need to avoid. It is thus required to first reduce the concentration of flammable vapors by inert gas to a point H . After this when we introduce air inside the tank, the dilution of flammable mixture will follow the line HA which ensures that we are never in the flammable range during this process. 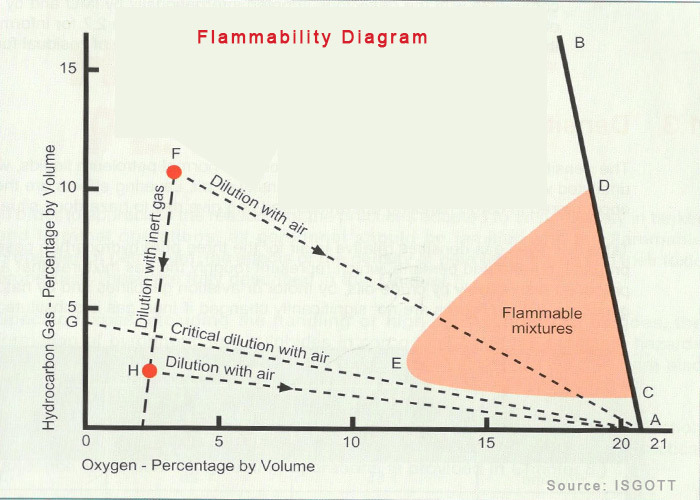 Knowledge of flammability diagram reminds us how important it is to be outside the flammability range. While we cannot deny that flammability is the top concern for anyone involved with the tanker operations. But no one can deny this too that human exposure to toxic gases is will be a close second if not top concern. It is the fact that many of he cargoes carried on all tankers contain deadly gases like benzene and H2S. Even WHO has recognised the exposure to benzene as a major public health concern. This makes it of utmost importance that a person taking first step on a tanker is aware of presence and exposure limits of these gases. To know how best to protect ourselves from the health hazards of these gases, we must know the terms related to exposure limits. This is also sometimes known as Permissible exposure limit (PEL). However the term PEL is not used on tankers these days. This is because the word “permissible” gives the feeling of allowed. Though this is safer limit but we need to aim for minimum exposure (and not the permissible exposure) of toxic vapors. Threshold seem to be a better word for that. TLV is the maximum concentration of toxic vapors that a person can be subject to each day without any adverse health effect. Though there are three types of TLVs , persons working on tankers should know at least two of these. This is concentration of toxic vapours that a person can be subject to continuously for 8 hours in a day without any adverse health effect. TLV-TWA takes into account the normal working schedule of 8 hours per day and 40 hours per week. 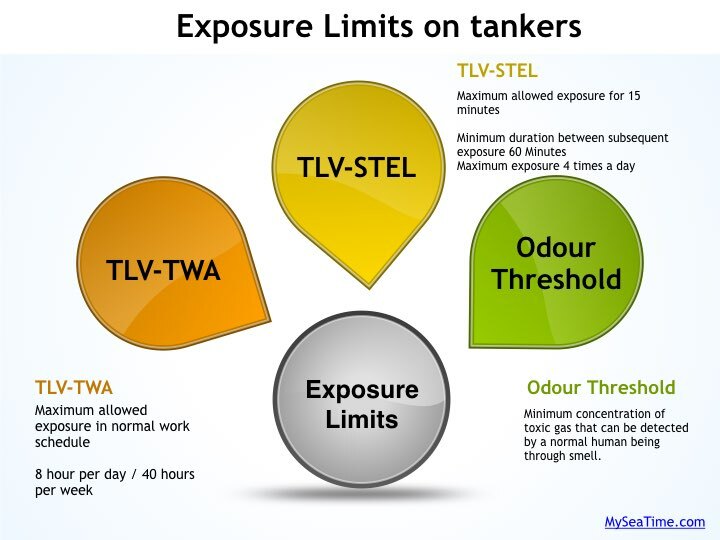 TLV-STEL is the maximum concentration of toxic vapours that a person can be subjected to for a short duration of 15 minutes without any adverse health hazard. Since STEL is for shorter duration than TWA, it will always be more than TWA value. But does that mean we can expose a person to the value of STEL for 15 minutes, take a break for 5 minutes and then again expose him for 15 minutes. A time duration need to be set. Right ? This is the minimum concentration of toxic vapors at which a normal human being can sense the smell (odour) of the gas. Why it is important to know the odour threshold value of a toxic gas ? If odour threshold value is more than TWA or STEL, you may get exposed to the toxic gas before you can even smell the presence of the toxic vapours. 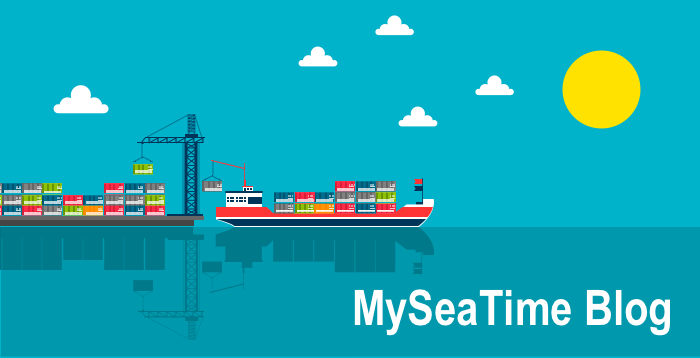 Everyone working on tankers must be aware of the exposure limits of the vapours released by the cargo onboard. And they should not enter any compartment which has the vapour concentration in excess of these exposure limits. Every vessel type have some must know terms. And like all the vessels, tankers too have some of these terms which any one associated with tankers must know before they board a tanker. On tankers these terms are related to the flammability and exposure limits of the toxic vapours. 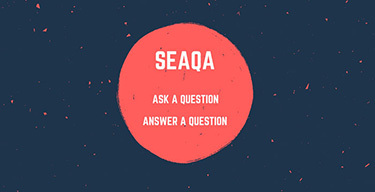 Knowledge of these terms helps the seafarers in identifying the risks. And once you know the risks, it just needs you to follow standard practices to mitigate these risks. sir please correct the value of propane after UFL diagram.It has been previously shown as 2.3% after the UFL diagram mentioned as 2.5%.Correct me if i am wrong. Thanks for pointing this out Ram..I have corrected this now..
Glad you found it useful Azeem. Yes sure, I will write more on passage planning and Ship interaction. 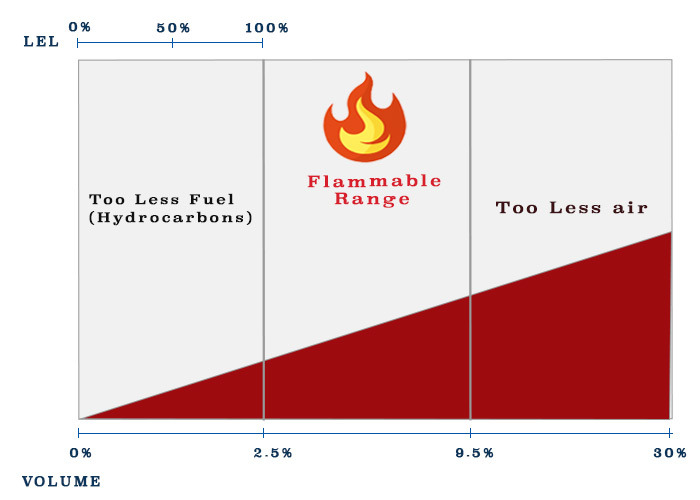 sir kindly change the same propane value in FLAMMABLITY RANGE diagram (image file) also , sorry i din't mentioned this before. Dear Capt. Rajeev, Indeed very good information. Please keep writing as you really write well these articles. Keep up the good work. Glad you found it useful Shardul..Thanks.. Thank you for sharing your practical knowledge on this matter. Sir, I have a question. When measuring the atmosphere in the tank since the explosimeter has 2 sensor for HC, one by LEL & by Vol. Does it automatically come to % vol after reaching 100% LEL? Say for propane its 2.3%, after its reached 2.3 which is equal to 100%, will the explosimeter show 2.4, 2.5 and so on? Do we need to set anything for a particular gas say pentane has 1.5%? Kindly contact me on mutaleaaron@ymail.com havE some questions to ask. Awesome sir.. It was so easily explained. Noone can make us understand in such a better way! Hello Capt, I have read most of your blogs. 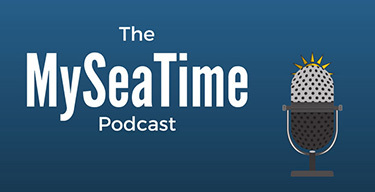 ... You are spoon feeding Maritime knowledge to the seafarers .... Thank you so much to sharing your knowledge to us...Expecting more topics from you..